Department of Zoology, DDU Gorakhpur University, Gorakhpur, Uttar Pradesh, India. The present review explains therapeutic and pharmaceutical potential of Cinnamomum tamala a well-known plant grows in high altitude areas of tropical and subtropical regions. This article emphasizes important uses of C. tamala constituents as spice, drug, and drug carrier with its therapeutic potential. Plant is a good depository of chemical constituents most of which are found in bark essential oils showed important biological activities such as antidiarrheic, antitumor, anti-inflammatory, anti-arthritic, antiparasitic, gastrourinary, antitumor, antiparasitic, antioxidant, chemopreventive, and gastroprotective. Plant leaves are used to generate special flavor to dishes, beverages and food items. Plant bark is a good source of essential oils and its phenolic compounds show multiple beneficial effects against Alzheimer's disease, cardiac mainly arteriosclerosis. Plant also shows therapeutic effects against cancer and inflammation, cardiac, and neurological disorders. Plant bark, fruits and leaves contain essential oil that shows nematicidal, termiticidal, larvicidal, microbicidal, antipyretic and anxiolytic activity. This article suggests wider use of C. tamala and its associating species in generation of chemopreventive anti-cancer, antiulcer, immunomodulatory,antilipidemic, antidiabetic and hepatoprotective drugs which might show broad-spectrum biological effectiveness. Cinnamomum tamala Nees and Eberm (family Lauraceae) is an Indian plant commonly known as Tejpat or Bay leaf.This is an important traditional medicinal plant found in various parts of India. Plant generally found in upper Himalayas at altitudes of 900 meter to 2500 meter. Genus Cinnamomum shows wider distribution as 350 species are reported worldwide . Plant contains aromatic leaves which are major source bioactive compounds of immense therapeutic, culinary and medicinal use. Plant has many synonyms and recognized by different names based on local area . In Bengali, it is called as tejpat, in Hindi tejpatta, in Marathi tamalpatra, in Telugu bagharakku, tamālapattram in Sanskrit, tejpata in Nepal, tsheringma herb that is used Bhutan in tea. Bay laurel leaves are shorter and light to medium green in color, with one large vein down the length of the leaf, while tejpat leaves are about twice as long and wider, usually olive green in color, and with three veins down the length of the leaf . True tejpat leaves impart a strong cassia- or cinnamon-like aroma to dishes, while the bay laurel leaf's aroma is more reminiscent of pine and lemon. Indian grocery stores usually carry true tejpat leaves. Cinnamomum cassia Presl bark is commonly used as ingredient in food and cosmetic industry . Cinnamomum verum (L.) dry bark is known as Dalchini'. Dried leaves of Cinnamomum tamala spread are used to flavora variety of food preparations. Plant bark and leaves are good source of aromatic essential oil which possess phenolic compounds which show multiple therapeutic effects against Alzheimer's disease, diabetes, arthritis, and arteriosclerosis. Plant emits clove-cinnamon like flavor. Essential oil is golden-yellow in colour, and possesses a very hot aromatic taste. Plant bark is rich source of cinnamaldehyde that provides a pungent taste and strong aroma that after exposure with oxygen, it become dark in colour and forms resinous compounds . Cinnamon essential oil contains more than 80 compounds  including eugenol and cinnamaldehyde as major constituents. Oil of cinnamomum is used in baked goods  and to flavor various alcoholic beverages . Cinnamon is mixed during distillation process to prepare cinnamon liqueur or barndy. It is also added to flavor white wine mainly Maiwein and vodka in Europe . Cinnamon bark is used as spice to flavor food. It is used in cookery as a condiment and flavouring material. It is also used to produce flavored chocolates in Mexico . Cinnamon is used in preparing buns, apple pie and dough nuts and in other desert recipes. Cinnamon mixed with sugar is used to flavored, sweet and savoury dishes, cereals, breads, toasts. It is also rubbed on fruits to provide a specific aroma. Cinnamon is used in important spices, pickling, soups, drinks, and sweets . Cinnamon is also used as a traditional medicine to alleviate pain and inflammation in patients those who suffer from arthritic rheumatism. Plant contains cinnamaldehyde, cinnamic acid, cinnamate, and numerous other components which show strong therapeutic effects against cancer and inflammatory, cardioprotective, and neurological disorders . Polyphenols showed good antioxidant, anti-inflammatory, antidiabetic, antimicrobial, anticancer effects . Plants leaves are nutrient rich contain a lot of manganese, iron, dietary fiber, and calcium. Besides, food applications, the dried leaves are used as medicine by local people. Leave paste is used for curing a number of ailments and has multiple health benefits. Its dried leaves and bark are prescribed for fever, anemia and body odor. People chew dried leaves to disguise bad mouth odor. Leaves and barks of cinnamon have aromatic, astringent, stimulant and carminative activities and are used in rheumatism, colic, diarrhea, and nausea and vomiting Indian system of traditional medicines. Its seeds are used after crushed and mixed with honey or sugar and administered to children for dysentery or cough . Cinnamomum tamala leaves put strong effect on biological systems such as immune system, gastro-intestinal tract, and liver. The barkis also sometimes used for cooking and flavoring the food. Ancient literature on Ayurveda, Yunani, reveal therapeutic use of this plant in the first century A.D. Cinnamomum, Cinnamon bark, essential oils, bark powder showed multiple biological activity such as antioxidant, antidiabetic, anti-inflammatory, anticancer, and antimicrobial activity . C. camphora leaf essential oil shows antifungal and insecticidal action against gall midge and butterfly larvae, fruit flies, and fire ants. C. camphora oil shows effectiveness against human breast tumor cells. C. glaucescens fruit essential oil showed nematicidal, termiticidal and larvicidal activity. Essential oil of C. tamala is found toxic to mosquito larvae and fire ants . It is also found therapeutically effective against Alzheimer's disease, diabetes, arthritis, and arteriosclerosis, cancer and inflammatory, cardioprotective, and neurological disorders . Cinnamomum bark is a source of major procyanidin compounds, few of them are cinnamtannin B1, cinnamtannin D1(CTD-1), parameritannin A1, procyanidin B2, and procyanidin C1. These showed immunosuppressive effects and regulate immune function in experimental animals  (Table 1). Table 1: Showing therapeutic and biological efficacy of various major and minor bioorganic natural products isolated from Cinnamomumplant species. Ethyl and methyl alcohol extracts from C. verum containn trans-cinnamaldehyde and its analogues which showed good ameliorative effects (p<0.05) after day 2 of treatment  (Table 1). Cinnamomum tamala extracts showed antidepressant activity similar to imipramine at a dose level 400 mg/kg. Thesecause behavioral despair, learned helplessness, and tail suspension. Plant shows significant anxiolytic activity and has therapeutic beneficial for the management of psychological ailments . The essential oil isolated from the bark of Cinnamomum glanduliferum (Wall) Meissn showed strong antimicrobial activity against gram-positive bacteria, gram-negative bacteria, and fungi . Oil and its components showed strong antimicrobial activity against methicillin-resistant Staphylococcus aureus, Geotrichum candidum, Pseudomonas aeruginosa, Bacillus subtilis, Helicobacter pylori, Aspergillus fumigatus. Essential oil showed growth inhibitory effectsagainst S. aureus and Mycobacterium tuberculosis, Escherichia coli, and displayed minimum inhibitory concentration (MIC) in range of 0.49 μg/ml to 32.5 μg/ml). Cinnamomum tamala also showed antidiarrhoeal activity  (Table 1). Cinnamomum tamala extract is used to biosynthesize magnetic iron nanoparticles (MFeNp) are used for sludgedewatering. The breakdown of extracellular polymeric substances (EPS) by the MFeNp leads to the significant reduction in proteins, polysaccharides, water content and heavy metals. These particles have shown maximum removal efficiency of water from the sludge was 85.9%, hence, this treated and contaminant free water can be used for irrigation of agricultural fields . SNPs synthesized using aqueous leaf extract of Cinnamomum tamala do inhibition of antibiotic resistant haloarchaeal isolates Haloferax prahovense RR8, Haloferax lucentense RR15, Haloarcula argentinensis RR10 and Haloarcula tradensis RR13. More possible this action of particles may alter and disrupt haloarchaeal membrane permeability, inhibit respiratory dehydrogenases and lipid peroxidation. It also imposes DNA damage that results in microbial cell death . Cinnamon tamala leaf constituents showed anticancer activity against human ovarian cancer cells. Its leaf extractscontain bornyl acetate that exhibit strong cytotoxicity to cancer cells in vitro . It significantly reduces prostatic enlargement and improved hyperplastic changes. It also showed mild to moderate anti-inflammatory activity  (Table 1). Cinnamomum cassia extracts reverses TGF-β1-induced epithelial-mesenchymal transition in human lungadenocarcinoma cells and suppresses tumor growth in vivo . C. cassia extracts also obstruct tumor growth of human lung adenocarcinoma cells and inhibit transforming growth factor (TGF)-β1-induced cell motility and invasiveness. Tenuifolide B found in Cinnamomum tenuifolium stem also inhibit proliferation of oral cancer cells via apoptosis, ROS generation, mitochondrial depolarization, and DNA Damage . It potentially suppresses cancer cell viability, obstruct cell cycle, and induce apoptosis, oxidative stress, and DNA damage. Cinnamomum cassia was found cytotoxic to colon (HCT-116), liver (HepG2), and breast (MCF-7) carcinoma cell lines. Essential oil from C. tamala shows potent antifungal activity against Aspergillus niger, A. fumigatus, Candida albicans, Rhizopus stolonifer and Penicillium spp. Its various solvent extracts exhibit antioxidant activity inβ-carotene bleaching assay and reducing power assay. C. tamala leaf extracts significantly inhibited growth of food spoilage/pathogenic fungi. These can also mitigate the oxidative stress by antioxidant response  (Table 1). C. tamala possess two major components cis-2-methoxycinnamic acid (43.06%) and cinnamaldehyde (42.37%).cinnamaldehyde, possess potent anti-tyrosinase activities and may be a good source for skin-whitening agents  (Table 1). Cinnamomum cassia was found effective against Helicobacter pylori a dreadful pathogen that severely infect GI tract.Cinnamomum cassia extract contains bioactive candidates which could be used in chemoprevention of peptic ulcer. It also shows anti-inflammatory and cytoprotective effects . Cinnamomum glanduliferum leaf essential oil shows gastroprotective effect in experimental animals. CG oil exhibited asignificant modulatory effect on ethanol-induced gastritis in rats and does significant inhibition of lipid peroxidation. CG volatile oil was found effective against non-anti-ulcerative gastritis and display anti-inflammatory activity . Cinnamomum cassia shows anti-gout and antiseptic responses in experimental animals. It is used to treat dyspepsia,gastritis, blood circulation, and inflammatory diseases . It suppresses inflammation-related disorders by regulating the formation of inflammasome activation and cut down interleukin-1β secretion. Furthermore, use of CA improves survival rate of LPS-induced septic shock and gout murine model. Cinnamon polyphenol cut down hyperlipidemia, slow down inflammation, and release out oxidative stress through activation of transcription factors and making antioxidative defense . It also cut down body weight, visceral fat, liver weight and serum glucose and insulin concentrations, liver antioxidant enzymes, and restore lipid profile. Cinnamon polyphenol suppress hepatic SREBP-1c, LXR-α, ACLY, FAS, and NF-κB p65 expressions and enhance the PPAR-α, IRS-1, Nrf2, and HO-1 expressions in the HFD rat livers (P<0.05). C. cassia plant extract contains important bioactive candidates such as coumarin, trans-cinnamic acid,cinnamaldehyde, 2-hydroxycinnamaldehyde, 2-methoxycinnamaldehyde (6), 2-hydroxy-cinnamyl alcohol, benzoic acid, (+)-syringaresinol and phenethyl (E)-3-[4-methoxyphenyl]-2-propenoate which display diverse biological activity . Its solvent extracts were found effective against gastritis, diabetes, blood circulation disturbance and inflammatory diseases  (Table 1)These also showed cardio-protective effects and reduce blood pressure, plasma glucose, obesity and ameliorating dyslipidemia. Cinnamomum camphora essential oil and its isolated constituents showed insecticidal activity against the stored grainpests . It also displays strong fumigant action against Tribolium castaneum and Lasioderma serricorne adults . The essential oil from the twigs of Cinnamomum cassia Presl alleviates pain and inflammation in mice . Cinnamomum cassia twigs are used to treat inflammatory processes, pain, menstrual disorders, hypertension, fever etc.Essential oil inhibits carrageenan-induced mechanical hyperalgesia and paw edema and subsequently decreased the levels of cytokines TNF-α, and IL-1β, NO, and PGE2. Cinnamomum cassia Presl, plant also possesses antinociceptive and anti-inflammatory properties. The root essential oil of C. tamala found toxic to mosquito larvae and fire ants . Silver (Ag) and gold (Au) nanoparticles (NPs) synthesized by using the aqueous bark extract of Cinnamomum zeylanicum showed larvicidal activity has been tested against the malaria vector Anopheles stephensi and filariasis vector Culex quinquefasciatus. Nanoparticles AgNPs and AuNPs were found highly susceptible to An. stephensi than the Cx. quinquefasciatus. C. zeylanicum synthesized silver and gold nanoparticles have the potential to be used as an ideal eco-friendly approach for the control of mosquito  (Table 1). Cinnamomum iners Reinw showed carminative, analgesic and antipyretic properties. It was found active in postpartumtreatment, rheumatism and digestive ailments . More often, cinnamyl derivatives isolated on organic solvent-extractable fractions of Cinnamomum cassia antipyretic activity . Extracts from Cinnamomum cassia contains cinnamaldehyde and cinnamic acid that work potential candidate antiparasitic agent against Dactylogyrus intermedius  found in in goldfish (Carassius auratus) . Similarly, transcinnamaldehyde successfully kills parasitic worms of the intestine i.e., Trichuris suis and Oesophagostomum dentatum larvae . The essential oil obtained from C. aromaticum Cinnamon bark contains trans-cinnamaldehyde as a major component (79%) . It shows anti-parasitic action against flagelated poultry parasites Tetratrichomonas gallinarum and Histomonas meleagridis. Both types of PLGA nanoparticles loaded with CBE were effective inhibitors of Salmonella enterica serovar Typhimurium and Listeria monocytogenes after 24 h and 72 h at concentrations ranging from 224.42μg/mL to 549.23 μg/mL. The PLGA encapsulation shows improved delivery of hydrophobic antimicrobial to the pathogens in aqueous media . related disorders. Its polyphenolic fraction shows anti-inflammatory and anti-arthritis potential or anti-rheumatic agent with disease-modifying action . It put impact on cytokines (IL-2, IL-4, and IFNγ) released from Concanavalin (ConA)-stimulated lymphocytes. CPP showed a strong and dose-dependent reduction in paw volume, weight loss reversal effects against carrageenan-induced paw edema, and cotton pellet-induced granuloma models in rat’s action . CPP was found to inhibit cytokine (IL-2, IL-4, and IFNγ) release from ConA-stimulated lymphocytes in vitro. Cinnamomum verum extract mediated nanosilver (CENS) particles showed good antibacterial activity and acceleratedwound healing with complete epithelialisation and normal re-growth of hair in animal models after topical application. CENS promotes collagen synthesis, stabilize wound besides countering oxidative stress and stimulating cellular proliferation. It could be use a novel therapeutic agent for wound management . Trans-cinnamaldehyde (CA), is main essential oil constituent isolated from Cinnamomi cortex. It inhibits growth of influenza A/PR/8 virus in vitro and in vivo and is used to treat acute respiratory infectious diseases . Similarly, Cardiospermum helicacabum (shoot + fruit) extracts were found against HIV-1 and HIV-2 . The silver nanoparticles derived from Cinnamon extract enhanced the antiviral activity. Similarly, silver nanoparticles synthesized from Cinnamomum cassia extract were found effective against H7N3Influenza A Virus. These effectively decrease HRSV-induced plaque formation and syncytium formation in respiratory mucosal cell lines. It removes off obstructions occurred in airway epithelia due to HRSV infection through inhibiting viral attachment, internalization and syncytium formation . Cinnmomum functionalized nanoparticles have vast industrial application. These are used as therapeutic drugs, carriers and metabolizables. Fe3O4 nanoparticles coated with bio-ingredients from isolated from C. verum showed strong antibacterial activity against both gram-positive and gram-negative bacteria . These showed improvement in anti-adherent properties, and inhibit colonization of both Gram-negative and Gram-positive bacteria. Similarly, 1-octadecylimidazolium ionic liquid modified magnetic nanoparticles (Fe3O4@SiO2@ImC18) were used to isolate flavonoid compounds of myricetin, quercetin and luteolin and cinnamic acid from cinnamon. These particles have large scale use in pharmaceutical and food industry . Similarly, Cinnamon-coated gold nanoparticles (Cin-AuNPs) are used for diagnosis of cancer. These nanoparticles are non-toxic and show excellent CT/photoacoustic contrast-enhancement and can be used for tumor detection . Biomolecule-loaded nanoparticles (GSCNPs and CZCNs) exhibit dose-dependent cytotoxicity and induce apoptosis in a human cervical cancer (SiHa) cell line . Similarly, chitosan and gold nanoparticles prepared synthesized from Cinnamomum zeylanicum leaf constituents displayed very high antibacterial activity against the tested gram-negative bacterium Escherichia coli and gram-positive bacterium Staphylococcus aureus . These also showed antifungal activity against Aspergillus niger and Fusarium oxysporum. Similarly, silver nanoparticles syntheised from Cinnamomum cassia leaf constituents showed high antimicrobial potential against Candida albicans . Their MIC and MFC values were found in a range of 0.0006% to 0.0097% (v/v) and 0.0012% to 0.019% (v/v), respectively. Use of cinnamon acts as an antagonist of the TLR4 complex, and hydrogen and reduces the health-related effects generated due to emissions released from laser printers and photocopiers (LPandP) . It dissolute irritation and hyper-responsiveness of the upper and lower respiratory tract; and slow down the process of chronic fatigue syndrome. Similarly, cinnamon oil nano-emulsion (droplet diameter of 65 nm) was found growth inhibitory to Bacillus cereus. It can be used for preservation of minimally processed food . CoP nanoparticles (NPs) in CaCO3 NP-templated Cinnamomum platyphyllum leaf extract-derived carbon also have high industrial application . Similarly, gold nanoparticles synthesized by using using Cinnamomum zeylanicum leaf broth act as the reducing agent . Phytochemical analysis of C. tamala leaf extract revealed presence of important saponins, phytosterols, fatty acids, carbohydrates, monoterpene, sesquiterpene, geraniol and linolol, bornyl acetate, caryophylene oxide, p-coumaric acid and vanillic acid . Plant leaves also contain, procyanidin oligomers compounds, mainly cinnam, tannin B1, cinnamtannin D1 (CTD-1), parameritannin A1, procyanidin B2, and procyanidin C1 in bark . C. tamala, also contain cinnamtannin D-1 (CD1) as one of the main A-type procyanidin oligomers . Tenuifolide B is isolated from Cinnamomum tenuifolium stem that showed therapeutic activity. Twigs of C. cassia contain cinnamomulactone,coumarin, trans-cinnamic acid, cinnamaldehyde, 2-hydroxycinnamaldehyde, 2-methoxycinnamaldehyde, 2-hydroxy-cinnamyl alcohol, benzoic acid, (+)-syringaresinol and phenethyl (E)-3-[4-methoxyphenyl]-2-propenoate with strong therapeutic potential . Plant bark essential oil contain some minor constituents with significant chemotypic variations i.e., p-cymene, cinnamicaldehyde, eugenol, linolool, alpha and beta-pinene, limonene, 3,3,4,5,7-pentahydroxyflavone, kaempferol-3-o-saphoroside, kapeferol-3-o-glucopyranoside and quercetin-3-o-rutenoside and diverse biological activity . Plant also contains steroids, terpenoids and tannins, polysaccharides , procyanidins cpd3, cpd4 and cpd6  and glycosides, cinnacassides F and G, with a rare geranylphenylacetate carbon skeleton  (Figure 1). These compounds have shwon immunomodulatory and immunosuppressive activities against murine lymphocytes Cinnamaldehyde is major chemical constituent component (44.898%) of essential oil found in Cinnamon tamala leaves that possess multiple biological activitiy . Cinnamon contains derivatives, such as cinnamaldehyde, cinnamic acid, cinnamate, and numerous other components such as polyphenols and antioxidant, anti-inflammatory, antidiabetic, immunomodulatory and immunosuppressive antimicrobial, anticancer effects  (Figure 1). Figure 1. 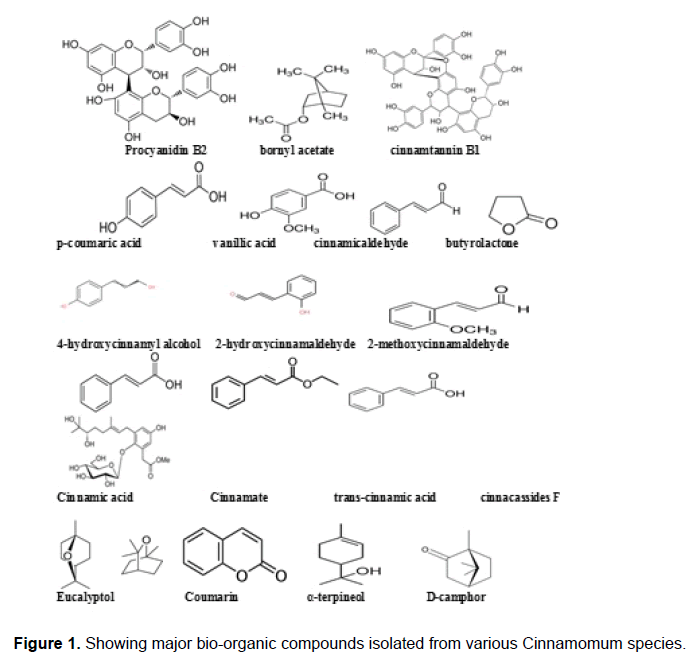 Showing major bio-organic compounds isolated from various Cinnamomum species. C. tamala and its associating species are rich source of economically important bio-organic products which can belargely used for preparation of flavored foods, pharmaceuticals and pesticides. Both leaves and plant bark of this plant is widely used in folk medicine. C. verum bark is used as Dalchini a specific spice. Its leaves are used to provide a specific aroma to vegetable curries. This plant has enormous therapeutic potential as it can obstruct metastasis and lower down cancer-related mortality in patients. Its bioorganic ingredients can kill drug resistant pathogens. Cinnamomum sp. volatile contains alkaloids, triterpenes, cinnamaldehyde which showed antioxidant, anti-inflammatory, antidiabetic, anti-inflammatory, immunomodulatory, immunosuppressive antimicrobial, anticancer effects and anti-food spoilage/ antipathogenic activity. Cinnamon polyphenol reduces the hyperlipidemia, inflammation, and oxidative stress through activating transcription factors and antioxidative defense signaling pathway in HFD rat liver. Essential oils obtained from this plant possess various active ingredients which can be used to control insects and nematodes and drug resistant bacteria and fungi. These can be processed to obtain pharmaceutical agents mainly against gastric, diabetic, high blood pressure and neurological problems. Cinnamomum species contain major group of biologically active chemicals that can be used to make highly efficacious broad spectrum pharmaceutical products. Xi-Wen Li. Cinnamomum tamala. Flora of China. Missouri botanical garden, St. Louis, MO and Harvard University Herbaria, Cambridge, MA. Retrieved 29 March 2013. Naoka Y and Michiho I. Influence of composition upon the variety of tastes in Cinnamomi cortex. J Nat Med. 2009;63(3):261–266. Jayaprakasha GK and Rao LJ. Chemistry, biogenesis, and biological activities of Cinnamomum zeylanicum. Cr Rev Food Sci. 2011;51(6):547-62. Oil of cinnamon. Toxicology Data Network (TOXNET). 2002. Haley Willard for The Daily Meal. 11 Cinnamon-Flavored Liquors for the Holidays. 2013. Haley Willard 2013. 11 Cinnamon-Flavored Liquors for the Holidays. The Daily Meal. 2013. Trade and Sustainable Forest Management -Impacts and Interactions. 2003. Czarra, Fred 2009. Spices: A Global History. Reaktion Books. ISBN 9781861896827. Hariri M and Ghiasvand R. Cinnamon and Chronic Diseases. Adv Exp Med Biol. 2016;929:1-24. Grover JK. Medicinal plants of India with antidiabetic potential. J Ethnopharmacol. 2002;81:81-100. Chen L, et al. Diverse mechanisms of antidiabetic effects of the different procyanidin oligomer types of two different cinnamon species on db/db mice. J Agric Food Chem. 2012;60(36):9144-91450. Taha AM and Eldahshan OA. Chemical characteristics, antimicrobial, and cytotoxic activities of the essential oil of Egyptian Cinnamomum glanduliferum Bark. Chem Biodivers. 2017;14(5). Venkateswara RC, et al. (2008). Antidiarrhoeal activity of the standardised extract of Cinnamomum tamala in experimental rats. J Nat Medi. 62(4):396–402. Ealias AM, et al. Biosynthesised magnetic iron nanoparticles for sludge dewatering via Fenton process. Environ Sci Pollut Res Int. 2016;23(21):21416-21430. Thombre RS, et al. Antimicrobial activity and mechanism of inhibition of silver nanoparticles against extreme halophilic archaea. Front Microbiol. 2016;7:1424. Sun P, et al. Trimer procyanidin oligomers contribute to the protective effects of cinnamon extracts on pancreatic β-cells in vitro. Acta Pharmacol Sin. 2016;37(8):1083-1090. Chakrobarty U and Das H. Antidiabetic and antioxidant activities of Cinnamomum tamala leaf extract in Stz-treated diabetic rat. Glob J Biotech Biochem. 2010;5:12-18. Bajaj S, Srinivasan BP. Investigations into the anti-diabetic activity of Azadirachta indica. Scoparia dulcis. Indian J Pharmacol. 1998;31:138-141. Chandola HM, et al. Effect of Cinnamomum tamala on plasma insulin vis-à-vis blood sugar in patients of 269 diabetes mellitus. J Res Ayur Sidha. 1980;1:345-357. Sharma DK, et al. Antihyperglycaemic and antioxidant effects of methanolic extract of cinnamomum tamala leaves in alloxan induced diabetes in rats. The Indian Veterinary Journal. 2012;89(6):72-74. Wang T, et al. Cinnamtannin D-1 protects pancreatic β-cells from palmitic acid-induced apoptosis by attenuating oxidative stress. J Agric Food Chem. 2014;62(22):5038-5045. Singh V, et al. Combined potentiating action of phytochemical(s) from Cinnamomum tamala and Aloe vera for their anti-diabetic and insulinomimetic effect using in vivo rat and in vitro NIH/3T3 cell culture system. Appl Biochem Biotechnol. 2015;175(5):2542-2563. Shahwar D, et al. Anticancer activity of Cinnamon tamala leaf constituents towards human ovarian cancer cells. Pak J Pharm Sci. 2015;28(3):969-972. Dumbre RK, et al. Inhibitory effects by ayurvedic plants on prostate enlargement induced in rats. Pharmacognosy Res. 2014;6(2):127-132. Lin CY, et al. Cinnamomum cassia extracts reverses TGF-β1-induced epithelial-mesenchymal transition in human lung adenocarcinoma cells and suppresses tumor growth in vivo. Environ Toxicol. 2017;4. Chen CY, et al. Tenuifolide B from Cinnamomum tenuifolium stem selectively inhibits proliferation of oral cancer cells via apoptosis, ROS generation, mitochondrial depolarization, and DNA damage. Toxins (Basel). 2016;8(11)pii:E319. Pandey AK, et al. Antifungal and antioxidative potential of oil and extracts derived from leaves of Indian spice plant Cinnamomum tamala. Cell Mol Biol (Noisy-le-grand). 2012;58(1):142-147. Chang CT, et al. Chemical composition and tyrosinase inhibitory activity of Cinnamomum cassia essential oil. Bot Stud. 2013;54(1):10. Zaidi SF, et al. Anti-inflammatory and cytoprotective effects of selected Pakistani medicinal plants in Helicobacter pylori-infected gastric epithelial cells. J Ethnopharmacol. 2012;141(1):403-410. Azab SS, et al. Anti-inflammatory and gastroprotective potential of leaf essential oil of Cinnamomum glanduliferum in ethanol-induced rat experimental gastritis. Pharm Biol. 2017;55(1):1654-1661. Shin WY, et al. Protective effects of Cinnamomum cassia (Lamaceae) against gout and septic responses via attenuation of inflammasome activation in experimental models. J Ethnopharmacol. 2017;pii: S0378-8741(16)32278-322784. Tuzcu Z, et al. Cinnamon polyphenol extract inhibits hyperlipidemia and inflammation by modulation of transcription factors in high-fat diet-fed rats. Oxid Med Cell Longev. 2017;2017:1583098. Kim GJ, et al. Cinnamomulactone, a new butyrolactone from the twigs of Cinnamomum cassia and its inhibitory activity of matrix metalloproteinases. Arch Pharm Res. 2017;40(3):304-310. Guo S, et al. The chemical composition of essential oils from Cinnamomum camphora and their insecticidal activity against the stored product pests. Int J Mol Sci. 2016;17(11). pii: E1836. Soni N and Prakash S. Green nanoparticles for mosquito control. ScientificWorldJournal. 2014;2014:496362. Mustaffa F, et al. Review on pharmacological activities of Cinnamomum iners Reinw. ex Blume. Nat Prod Res. 2013;27(10):888-895. Ling F, et al. Anthelmintic efficacy of cinnamaldehyde and cinnamic acid from cortex cinnamon essential oil against Dactylogyrus intermedius. Parasitology. 2015;142(14):1744-1750. Ji J, et al. Screening of 42 medicinal plants for in vivo anthelmintic activity against Dactylogyrus intermedius (Monogenea) in goldfish (Carassius auratus). Parasitol Res. 2012;111(1):97-104. Williams AR, et al. Anthelmintic activity of trans-cinnamaldehyde and A- and B-type proanthocyanidins derived from cinnamon (Cinnamomum verum). Sci Rep. 2015:5:14791. Hill LE, et al. Antimicrobial efficacy of poly (DL-lactide-co-glycolide) (PLGA) nanoparticles with entrapped cinnamon bark extract against Listeria monocytogenes and Salmonella typhimurium. J Food Sci. 2013;78(4):N626-N632. Rathi B, et al. Ameliorative effects of a polyphenolic fraction of Cinnamomum zeylanicum L. Bark in animal models of inflammation and arthritis. Sci Pharm. 2013;81(2):567-589. Pothireddy S, et al. Evaluation of the wound healing efficacy of chemical and phytogenic silver nanoparticles. IET Nanobiotechnol. 2016;10(5):340-348. Hayashi K, et al. Inhibitory effect of cinnamaldehyde, derived from Cinnamomi cortex, on the growth of influenza A/PR/8 virus in vitro and in vivo. Antiviral Res. 2007:74(1):1-8. Premanathan M, et al. A survey of some Indian medicinal plants for anti-human immunodeficiency virus (HIV) activity. Indian J Med Res. 2000;112:73-77. Yeh CF, et al. Water extract of Cinnamomum cassia Blume inhibited human respiratory syncytial virus by preventing viral attachment, internalization, and syncytium formation. J Ethnopharmacol. 2013;147(2):321-326. Anghel AG, et al. MAPLE fabricated Fe3O4@Cinnamomum verum antimicrobial surfaces for improved gastrostomy tubes. Molecules. 2014 :19(7):8981-8994. Liu H, et al. Octadecylimidazolium ionic liquid-modified magnetic materials: Preparation, adsorption evaluation and their excellent application for honey and cinnamon. Food Chem. 2017:229:208-214. Chanda N, et al. An effective strategy for the synthesis of biocompatible gold nanoparticles using cinnamon phytochemicals for phantom CT imaging and photoacoustic detection of cancerous cells. Pharm Res. 2011;28(2):279-291. Sujima Anbu A, et al. Biomolecule-loaded chitosan nanoparticles induce apoptosis and molecular changes in cancer cell line (SiHa). Int J Biol Macromol. 2016;88:18-26. Smitha SL and Gopchandran KG. Surface enhanced Raman scattering, antibacterial and antifungal active triangular gold nanoparticles. Spectrochim Acta A Mol Biomol Spectrosc. 2013;102:114-119. Szweda P, et al. Essential oils, silver nanoparticles and propolis as alternative agents against fluconazole resistant Candida albicans, Candida glabrata and Candida krusei Clinical Isolates. Indian J Microbiol. 2015;55(2):175-183. Lucas K and Maes M. Molecular mechanisms underpinning laser printer and photocopier induced symptoms, including chronic fatigue syndrome and respiratory tract hyperresponsiveness: pharmacological treatment with cinnamon and hydrogen. Neuro Endocrinol Lett. 2013;34(8):723-737. Ghosh V, et al. Cinnamon oil nanoemulsion formulation by ultrasonic emulsification: investigation of its bactericidal activity. J Nanosci Nanotechnol. 2013;13(1):114-122. Yuan W, et al. CoP nanoparticles in situ grown in three-dimensional hierarchical nanoporous carbons as superior electrocatalysts for hydrogen evolution. ACS Appl Mater Interfaces. 2016;8(32):20720-20729. Sofowora A: John Wiley and Sons; 1993. Medicinal plants and traditional medicines in Africa; pp. 256–257. Bhardwaj DK, et al. Polyphenolic component of C. tamala. Proc, Indian Natl Sci Acad, Part A. 1983;49:413–417. Kumar S, et al. GC-MS analysis and screening of antidiabetic, antioxidant and hypolipidemic potential of Cinnamomum tamala oil in streptozotocin induced diabetes mellitus in rats. Cardiovasc Diabetol. 2012;11:95. Zeng JF, et al. Two new geranylphenylacetate glycosides from the barks of Cinnamomum cassia. Nat Prod Res. 2017:1-7. Ahmed A, et al. Essential oil constituents of the spice Cinnamomum tamala (Ham.) Nees and Eberm.. Flavour and Fragrance Journal. 2000;15(6):388-390. Pandey AK and Mishra AK. Antifungal and antioxidative Potential of oil and extracts derived from leaves of Indian Spice Plant Cinnamomum tamala. Cell Mol Biol. 2012;58(1):142. Chanda N, et al. An effective strategy for the synthesis of biocompatible gold nanoparticles using cinnamon phytochemicals for phantom CT imaging and photoacoustic detection of cancerous cells. 2011;28(2):279-291. Eswaran MB and Surendran S. Gastroprotective activity of Cinnamomum tamala leaves on experimental gastric ulcer in rats. J Ethanopharmacol. 2010:24;128(2):537-540. Manmeet S, et al. Cytotoxic activity of Cinnamomum tamala linn against Ehrlich Ascites Carcinoma (EAC) in mice. The Pharma Research, 2010;3;232-242. Soumya S, et al. Antiinflammatory, analgesic and antipyretic activity of methanolic extract of Cinnamomum tamala in experimental animal models. Int. Journal of Bioassays. 2012;1(9):1-4. Selvam NT et al. Hepatoprotective activity of methanolic extract Of Cinnamomum Tamala (Nees) against paracetamol intoxicated swiss albino mice. International J Pharm World Res. 2010;1(2):1-13.